Father, There are many who have lost their jobs. Those with jobs are overworked and doing two people’s jobs. Touch the hearts of the leaders from every sphere of influence not to lose sight of their most precious commodity—human capital. Bless them to honor and do the right thing by their employees who make them successful every day. Bless them to treat their employees as they would want to be treated with respect, commitment and loyalty. Amen. Father, There is so much happening in the world and it seems as though You have been left out. Bless us to never forget You and to recognize You in everything that we do. Bless us to glorify You in everything we do every day. Amen. Father, I realize You have so much for me. Sometimes, I find myself not doing everything I need to do, but I know when I team up with You success is always mine. Bless me to begin my day with You, acknowledge You throughout the day for Your guidance and direction, and when the day ends to spend more time thanking You for an awesomely successful day. Amen. Father, You have placed me in authority over others. Bless me to be the leader You would have for me to be and to treat those under my authority with the same respect I would like to be treated. Bless me to motivate them to perform with a spirit of excellence as they are able to achieve beyond their threshold of expectation. Amen. Father, Every minute of preparation brings me to a place where I have to ask myself if I have done all I know to do. Sometimes that answer is a resounding yes and sometimes it is a looming maybe. As long as it is not a cacophonous no, I continue to expect everything to be successful because I believe in the veracity of your promise that obedience is better than sacrifice. Amen. A friend of mine’s son was searching for a job and was unable to find one. He couldn’t figure out why he was not successful since he was doing everything within his power to land a job. When he asked his mother, she pointed out that every day he read the sign on his door indicating he didn’t want to work for anyone but himself. She told him to simply take the sign down. He did. Within days this young man acquired a great job and was promoted repeatedly. All he did was take a sign off the wall that didn’t reflect his desired outcome. Oftentimes you are not successful because of the stimulus viewed every day. The more you meditate on that picture or words that provide you with the stimulus to achieve, believe me you are going to achieve. Conversely, if you meditate on negative stimulus, you got it, you won’t be successful. I read an article about a woman who would read aphorisms all the time, but did nothing in making them come true. “An aphorism, by definition, is a succinct statement containing a truth of general import. But because they are so clever and catchy, it’s all too easy to collect them, pay them a little lip service when the occasion presents itself, and then fail to translate that truth into action.” (Jeanine Gajewski, Washington SmartCEO Magazine, June, 2008) You have to be careful that you don’t become more absorbed in meditating on the stimulus without doing anything about it. I’ve been guilty of that as I’m sure most of you have been. I’ve come to realize that it is absolutely nothing wrong with meditating on the stimulus; the problem comes when you don’t act on it. The inherent truth in each of them has as much to do with meditating on them as much as it has to do with taking action. In order for them to propel you to another level, they have to become a part of your life. You have to put them into practice. The more you focus on them the more you will experience transformation of your mindset; and the more your mind is renewed the more you will take action and experience success. Whether it’s journaling, photo-journaling or just hanging words or pictures some place where you can visibly see them, if you don’t do anything afterwards it is an exercise in futility. Faith without the corresponding actions does not lead to success, but dismal failure. But faith with action leads to unparalleled success. 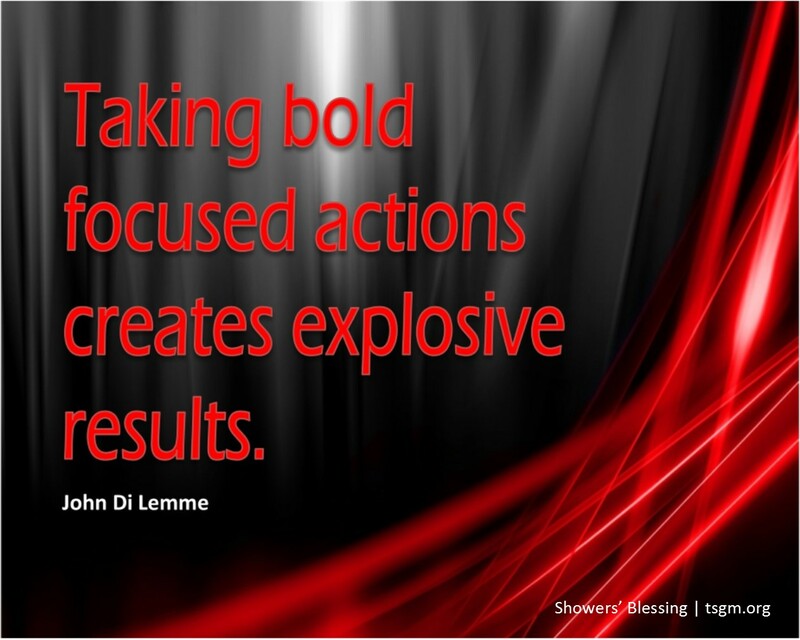 With that said, get focused, take action and expect stupendous success! Get Focused! Take Action! Experience Success! Contact me for a personal coaching session @ The ME Place. Father, Bless me to be a person who doesn’t merely meditate on pure and good things, but to be a person of action. I don’t want to just give lip service, but I want to be a doer. In doing so, I will experience all You have for me as You make my way prosperous and I will experience great success. Amen. Father, You are awesome! Regardless of how bumpy the journey may be success always looms before me. I may not know the outcome, but I am intimately involved with the One who ordained a successful outcome every single time. I expect no less, because You are a BIG BIG BIG G-O-D. Amen. Father, This peace that I have the world didn’t give it to me. This joy I have it didn’t come from the world either. My exceeding joy and peace that passes all understanding comes from You alone. Thank you for Your oil of joy that strengthens me and Your peace that propels me to a great calmness so I can hear Your voice providing daily instructions for guaranteed success. Amen. Father, Just a few weeks ago I looked around and it appeared as though storms were raging out of control. Oh but what the difference a few weeks make as I dwell in Your peace and great calmness completely trusting that You are restoring everything and I continue to walk down the pathway of success. Amen.